The special glamour of Christmas, shining or tawdry, subconscious, universal – a parlour even drunken sailors or the povertous working-class might aspire to – is hard to summon once the period itself has gone. Another year must pass. Another cycle of the seasons. But if Patrick Macnee, Diana Rigg and Mervyn Johns could manage to invoke the atmosphere for the Too Many Christmas Trees[i], in February 1965, ten months too soon, when Christmas must be the last thing on anyone’s mind, then their heroic effort is surely one to emulate[ii]? So, curtains closed, eyes closed, I struggle to summon Christmas in the mind’s eye: the sparkling frosts of advent, the hopes against the darkness, the impossible promise . . . all of which have meagre connection with either our escalated money-wasting or general religious cant – the whole feverish tension of the season. A season which fraught adults and damaged children alike, dread by association, despite all they might simultaneously yearn for. For every member of a family to get the holiday they wish in such a concerted mass situation; to maintain some mental depth amongst the excessive physical indulgence . . . Even as central a concept as sharing often becomes obliterated. The Fag End of the Year has long been my Dad’s appellation for Christmas, and he is relieved, so relieved, to stub it out. “Are you onto a new fag now?” I asked him on the 2nd of January, and he laughed with the light-heartedness of reprieve. Yet as a child, before they were bombed-out in 1942, his working-class family struggled to have a ‘front room’– a parlour they tried not to use except on special occasions. I’ve always wondered (and he has continued to scorn), whether his loathing of the season was in fact born of a love too intense for the disheartened mind to satisfy? Perhaps he once had the feeling I’m trying to revive now – of a mysterious specialness whose origin is impossible to locate? The only difference being that he has no aspiration to break on through to the other side[iii] . . . In the cold light of a typical advent day, whatever we desire for them to evoke, the lyrics of Irving Berlin’s, White Christmas, are rubbish. Even with music and mood they don’t add up to much – strange considering that the version sung by Bing Crosby, having sold more than 100 million copies, is supposedly the world’s most popular single . . . for aught we know, the best-selling single in the Universe! What’s missing with all such sales statistics however is the individual’s reason for buying the item in question – their subjective perception; our nostalgia; our buried idealism; our desire to conform. [iv] The huge breach between what we feel and the trite, insignificant or sentimental things which may trigger such feelings, is followed by another gap between the feelings and what we can explain of them. Occasionally, for brief moments such gaps may disappear. But it’s easy to lose any transient certainties which arise. We can’t trust ourselves. The default of cynicism provides too easy a retreat. The shallow modern climate has a disproportionately powerful undertow. Bing’s treetops may glisten, but can we get outdoors? Can we escape our material coffin to hear the sleigh bells in the snow? Our hearts might struggle to make our days merry and bright, but the weight of reality, the claustrophobia of time, is akin to being trapped in photos we don’t remember being taken. Distorted in the purple translucence of an ancient bauble, I can detach myself from all its biased reflections: the Christmas tree and open fire, this long seasonal history of collective presents. Fathoms down, under the wisping, shifting currents, below the potential depression of cold dark winter, the questing nausea, there might be some convincing bedrock. Do I have to be lost in space? Our tacky white Christmas tree – a dream of tree and snow combined – with its ethereal lights and holy baubles, must become, by force of will if nothing else, a talisman of hope. Isn’t that the thread all our lives hang upon: that of deciding just how grateful or happy we should or could be? How at first to invoke Christmas itself – or Yule or Joyeux Noël – from the heart and soul of the pagan primeval forest. How do they manage in hot countries or those with upside-down seasons? However much its universal, subliminal appeal may be caused by some strange oceanic state of mind, the riveting specifics of Christmas must be easier to come by in winter or dark or especially snow. . . All those pasts in our mind’s eyes . . . Films are good for summoning. The best depict the Christmas we will never have –that no-one ever had. But instead of the best, let’s take Holiday Inn (1942)[v]. I didn’t want to . . . but having forced myself to watch it, I feel I owe a debt to its whole-hearted, confectionate sincerity – which envelops the viewer like the dry-ice mist in a Roger Corman, Edgar Allan Poe adaptation. Holiday Inn is an island, a light-hearted House of Usher, and once there (like other borderland-dwelling exiles such as Guy Carrell in The Premature Burial), we the viewers, as well as all but the most oblivious characters, become half-haunted by their isolation. Towards the end of Holiday Inn, the film offers a film within a film, expecting us to believe that the same sets from a higher angle, with lights, microphones, and crew present, are a recreation of the earlier night when Bing and Marjorie were alone, wrapped in blankets, by a fire . . . and where they later strike up with White Christmas. The later fakery assures or declares that the earlier was real. And though the characters in Holiday Inn, even outdoors never show any signs of visible breath, as we do inside our house for a third of the year; it’s obvious they’ve no idea of cold and have never left a California studio. Despite all this, if we choose to believe their story, we can suspend disbelief – and surely life is only possible by suspending disbelief? Given the right mood or enough to drink, many will always be willing to accept Holiday Inn’s artifice – and somehow the later meta-fakery does make the earlier, sincere fakery, appear more genuine. I came to believe in their seasonal isolation. A Christmas island in retrospect. One candle flame in the darkness. On a walk in gloomy weather last January – evocative in a muddy, medieval sort of way – amongst huddling peasant masses of sheep, between small tors, there still lingered drifts and patches of snow. Whenever we crossed one of these patches, everything felt more optimistic, as though the sun had come out. Obviously, this was merely the effect of the whiteness – the extra light you need to keep the Christmas period and winter generally, bearable. Once, choosing a direct route probably less dangerous than glassily iced-up lanes and perilous roads, I walked ten miles across a moor swathed in deep snow, its surface mostly frozen. While roughly knowing the way and each compass direction’s approximate view, the landscape and all its distances had become visionary. But the best thing of all, was the reflected lightness which filled my brain. Though twilight darkened to night five miles in, it remained easy to see. Snow under starlight lit the way and the time-consuming marshes and gulleys, the hushes[vi] of old lead mines, were blanketed over, the stone walls on lower slopes, no more than a step over. I can’t say I wasn’t nervous. Once or twice the surface did break, even to my waist. If the temperature had increased by only a few degrees, the snow would have become an absorbing drift rather than a crusted blanket . . .
At last, descending into the dale where we lived, everything was laid out. The walls tracing black lines in the whiteness. 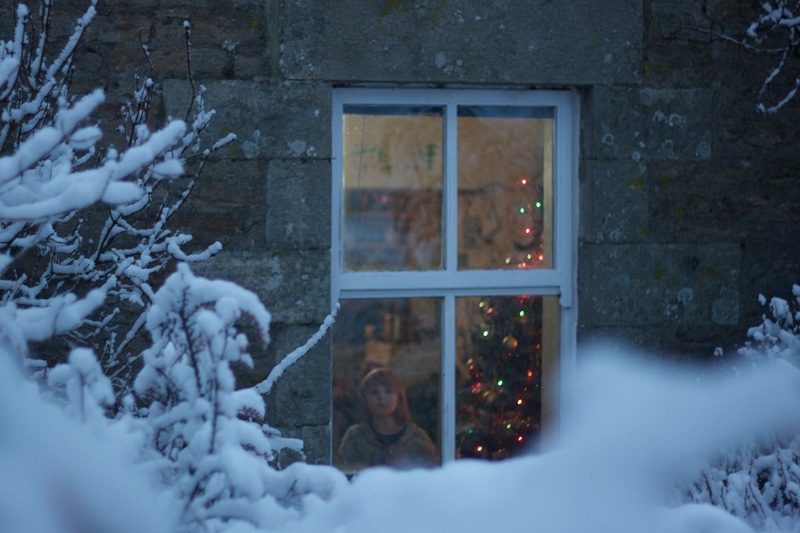 For two consecutive winters in Northumberland we were snowed in for five weeks. No vehicles could get to the house, the children were glad to miss a lot of school, and we went for long mesmeric walks, partly to keep warm. But the extra light at night, the extra sun during the day, made those winters seem short; and despite the freezing temperatures inside as well as out – our open fires ineffective beyond a radius of a few feet – rather than something to be endured, despite that neither spell quite overlapped with Christmas, those days became a special time in themselves – an indelible parallel life in memory. So, I can understand why the wealthy might pay for ski holidays – especially if their clothes and hotels are always warm. If they can avoid broken limbs, they might get a week or two of this strange extra light in a landscape as unreal as Christmas itself? But what is real and what unreal? In the end, if we’re lucky or determined enough, some of us, wealthy or poor, get the chance to choose that for ourselves – balancing conscience with survival. As for Holiday Inn, no matter how much the film within the film might illustrate the workings behind the Hollywood mask, or even behind the façade of Christmas, its style is its content. Anything extra – any of the mysterious truth that Christmas might inadvertently embody – depends on the audience. With few exceptions, for even the greatest art to live, commercial or not, such truths have to be immanent in us. We are what makes them live – if only we are up to it. By contrast, though it tries its best, Holiday Inn generally only exploits the blithe sentimentality which anyway thrives more readily at the festive time of year. Achieving the right mood with a glass of Christmas spirits, suspension of disbelief becomes easier and the maudlin, misty-eyed thoughts of all our years, all their ends and beginnings, are conjoined to invoke other ghosts of Christmas, past and future, fact or fiction. Personally, it being the afternoon, a pot of tea and a slice of yule log was all I had to accompany Holiday Inn. In the dark this was sufficient for me to believe in some of the quieter, faux-magical moments – even to empathise occasionally (despite acres of the mass singing and dancing I can barely abide), with some of the exuberance. I watched Holiday Inn to see how such a myth is created; to see how the fake is made to work – and I enjoyed my observational distance, my sentimental contempt. The film must be so much more powerful for those who love the songs. Actually, the songs aren’t so bad, it’s the dancing about – the mass chorus girls in leg-brandishing outfits – that are hardest to take. Even the joie-de-vivre seems counterfeit to me. No matter how well Fred Astaire especially, can make dance and joy flow, I still prefer him in the doomsday meditation of On the Beach. But that’s just me. However supercilious my reasons, eventually I was glad I’d watched Holiday Inn, if only for its atmosphere, the things half-seen, through romantic eyes half-closed. Later, watching it again, I even switched between original and ‘colorized’ versions, trying to get at its elusive hints beyond the curtain . . . Although colorizing is a procedure I would normally shun – a crass commercial pander to those immune to the greater, separate beauty of black and white – in a frame by frame analysis, the formula of Holiday Inn, actually seemed intensified by colorization. As though the multiple E numbers of its over-saturated genetics are simply crying out for maximum modification! From quieter moments deconstructed – such as the limited-studio-space curve with which the sleigh approaches the island building in fake snow – some weirdness stays in the back of the head . . . satisfying at least some residual spiritual need for a white Christmas? By February all such numinous glamour has become dim. How much of life really exists inside, with eyes closed? One such remembrance comes to mind: of a winter cycle through frosty hills and darkening woods to descend into the country town of Honiton and encounter under the dark Yew trees of a church in a heavy twilight, children streaming from the lychgate with candles stuck in oranges. A poster announced this was Christingle[vii] and it certainly threw me back (flashbacks within flashbacks) to distant parts of the country – to a festival of light in Norwich cathedral or a midnight mass in the village of Bierton. All these things most of us appreciate without any serious belief in their religious angle. Rather it’s the hushed ritual that inspires us, the light against the winter dark, the Yule or pagan aspects – all those things hijacked or attached to Christmas and its time-machine and now lodged in our collective memory. From early December many dream for frost and snow, desiring its extra reflected light, the enchanted touch of its fairy-tale icing, even if we could do without its inconvenience and danger. Against the low indoor temperatures of almost every house I’ve lived in, the implied whiteness of Christmas has always provided some kind of hymn. At least I’ve always been lucky enough to have a roof over my head. Yet a roof combined with cold can create claustrophobia – a dingy weight of reality, a melancholy in which all past time is lost. Now that Steed is dead, I feel there is somehow less of a way back to the world as it was when I was young. Depression, even my night claustrophobia, colours everything black. People say, “think of something you really like,” to children when they can’t sleep or others in depleted states. I used to think the sentence to myself when faced with school particularly on cold dead mornings, and would remember my Nan laughing or a summer lane, the sea or some defiant music . . . or in extremis perhaps – Christmas. But if you’ve succumbed to the entirely negative, nothing survives, there’s nothing to feel happy or grateful for. Yet (as though I was Guy Carrell in The Premature Burial), above the sound of nails being hammered into my coffin (!) comes the theme tune of The Avengers, positive again! During The Avengers, I’m back in the world I came from. No matter that I was only three or four when the best episodes were filmed. I’m bowling along on a winter dawn with Steed and Emma in the open Bentley, and the thought of Christmas, instead of a fag stubbed out, becomes positive again – in the way originally intended: a bright gathering of warmth and light. Nowadays materialism may try to contradict the dark all through the turning year, but like other mass religions before it, it only papers over the cracks. Without some genuine, self-generated, inner belief, these cracks will always prevail. No mass sheep-dream, no collective illusion works – or not for me. I’d rather be lost in space than in someone else’s religion, their ancient or technological coffins. We’ve destroyed the world and accelerated ourselves with it. We have become a blur and all our homes, literal and metaphorical, are in danger of being lost. Do you have to pass regularly through isolation to truly live? Certainly, you can only escape the recurring coffin, by a constant intensity of thought and feeling. Do we do enough of either anymore? Did we ever? At the schools I went to – the last of which absurdly fancied itself – we had seasonal nativities and hymn services. But the intended holy meanings rarely became more than a vague sympathy in my mind, a self-sympathy with a potential community sympathy – quickly withdrawn as the usual political connections were made. How many of us actually listened to those seasonal lectures – or any of the hypocritical and sanctimonious talk, privilege and wealth gives to poverty? It had a great back-garden that house, small but on the top of a hill overlooking a park. To the left distance, past the allotments the town began. Beyond the park and to the right, lay the housing estate where I grew up and its school where my dad worked. On beyond the water meadows that for a while forestalled further development, the subtle yet enigmatic, North Bucks landscape stretched out to ranges of low hills traversed by lanes well known to me and my friends from endless cycles. In summer, some of this view would be obscured by the huge sycamore tree at the end of its garden – a benign presence, a sentinel. Though I only knew that house via extended visits, my loyalty to it (and its to me), its fabric stays vivid in my mind, luckily detached from my actual growing up – enabling it to remain more a mentor than a lost childhood companion. When I dream of it however, it can leave behind on waking an overwhelming nostalgia, a sickness for home. When we are growing up, homesickness is implied or thought to be pathetic. As if we should leave home without a tinge of it. As if to feel it, is to still be a child. Perhaps because I left home at sixteen my sense of homesickness was profound for years. Whether I was in Devon, Wales, Lancashire or travelling abroad, I always felt in exile – and could never pinpoint the central source of this. It could be landscapes, buildings, country or the past. It was so general, that no one person, place or thing, could have satisfied it. In a way this feeling remains with me to this day. Waking up, I transfer the grief for my mother, for the past, to my parent’s later house. Next, if necessary, I might pass on to the fantasy England of The Avengers – something wholly outside but recurrent in my life. Is it so absurd to dwell on a place that does not change, that cannot change? At the base of my exile is London, changing so fast that one can only embrace it or turn away. That town beyond the green belt to which, from London, my parents relocated – that also will soon be unrecognisable. Worst of all, are all those post-war hopes that came to nothing – the libraries and NHS barely clinging on. Whether we’re conscious of it or not, we’re all in exile for such things, and what recurs most often and to everyone at the same time? – countless millions in the Western world and beyond: Christmas. Holy Christmas! Is this the true profundity beneath the season? Is that why truth is found within the searching audience as much as in any art? Forget the Pagan, the Christian or the gluttony of Materialism, forget the over-eating and drunkenness. Perhaps for millions, without us fully realising – and the reason we keep bothering – is that since we’ve accelerated the world and blurred any sense of meaning, Christmas is one of the last things left we all suffer or celebrate together. It stands in for our lost sense of home. No wonder my dad can’t stand it – when his Christmas parlour of hope and home was bombed out of existence. No wonder also, that as we age, crossing a threshold of reluctance, the Boxing Day doldrums, the old-year guilt, dragging past the inflated non-event of New Year’s Eve, we’re more than half-glad when Christmas is over: the bedrock of that home is so old it makes us melancholy and backward-looking. Unlike the unearthly light of midnight snow. [i] Yet another exceptional episode from the fourth and by far the best season of The Avengers. First broadcast on the 25th of December 1965. [ii] Beginning this Christmas digression in January 2018, I didn’t pick it up again until November, unfortunately failing to emulate Steed, Emma and Brandon Storey – I just ran out of festive spirit. [iii] On checking this faint allusion to The Doors, I was disappointed by how hard it was to find any reference to William Blake regarding the lyrics of ‘End of the Night’. [iv] Many feel obliged to buy popular items of all kinds, but to take historic literary best-seller Midnight’s Children for example, how many buyers actually finished reading it? By comparison of course, it doesn’t take much time or effort to play White Christmas – after which you can always fly the disc (or single) over the park as a makeshift frisbee. [v] Holiday Inn (1942) 100min. Director: Mark Sandrich. With: Bing Crosby, Fred Astaire, Marjorie Reynolds, Certificate U. [vi] Hushing is an ancient and historic mining method which deploys a flood or torrent of water to expose mineral veins. [vii] Despite being brought up in a mild, nominally Christian way, I knew nothing about Christingle, always letting the details behind such things just wash over me – yet I could intensely appreciate the atmosphere. Supposedly the red-ribbon around the oranges, symbolises the blood Jesus shed when he died for us. In view of all the religiously-stirred conflict in the world, perhaps the less said about being united in blood the better? This entry was posted on 1 December, 2018 in homepage and tagged Lawrence Freiesleben. Bookmark the permalink.